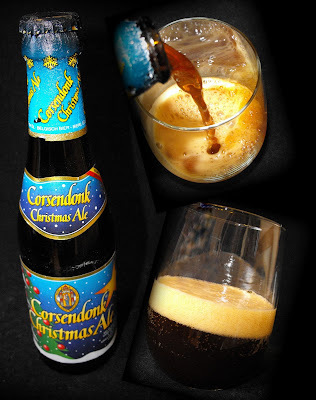 Every Christmas it's almost guaranteed that I'll receive a bottle of Corsendonk Christmas Ale as a gift. An appropriate gift to be sure and always happily received. Allow me to tell about the perfect accompanying gift - the Decapitator bottle opener. Described as The coolest bottle opener. Ever. It is, indeed, wicked cool. 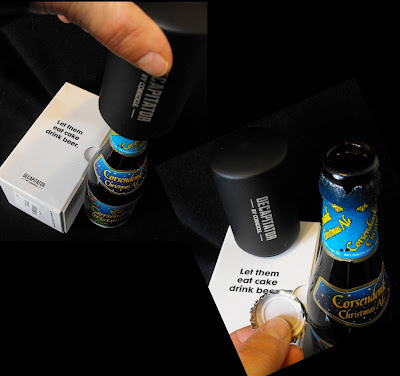 It opens bottles quick and easy with no fuss, muss, or mutilated caps. Especially cool if you save the caps. And, it's kind of fun to use to. Highly recommended for the beer drinker who wants to add a little excitement to their bottle opening experiences. I love mine! This is NOT a paid adveristment. Corsendonk Christmas Ale (8.50% ABV) is a Belgian Strong Dark Ale brewed by Brouwerij Corsendonk. As the name would suggest, this is a good Christmas beer. For a strong ale, the alcohol is well concealed and this brew goes down way too easy. This Christmas ale has a lot going on flavorwise. The smell and taste are malty with hints of dark fruit, burnt sugars, and seasonal spices like nutmeg and clove. The sweetness is offset by a mildly bitter finish that balances out the flavors The spices linger pleasantly on the palate after the beer is gone. If you're a fan of Belgian brews, Corsendonk Christmas Ale is something to look forward to every year. Did not find any in my local stores this year and that was a shame. Have gotten it 2 or 3 years out of the last few years. It is excellent brew.